400,000m3 of overburden removal at Potosi Open Cut Mine, Pasminco, Broken Hill. Construct 1.5km of new road - Ontario Ave, Mildura. Construction of 5km roadway over the Talyawalka bridges for the NSW RTA at Wilcannia. Construction of the new 1.5km runway at the Broken Hill Airport for Broken Hill City Council. Construction of artery roadways at the Moomba Gas Fields for Santos. Supply, deliver and place 3,500m3 of concrete to line a 6 metre diameter, 900 metre deep ventilation shaft for Pasminco Mining Broken Hill. Construct earth pads at Elura Mine Cobar to receive containerised hazardous waste product. Export blue stone aggregate and screenings from Broken Hill to the Sunraysia district and backload powdered cement in semi tippers for backfill operations with Pasminco Broken Hill. Work closely with the NSW RTA to extend road train routes from Curlwaa NSW to Buronga NSW. Primary crush 1.3 million tonnes of high grade ore from Pasminco Southern Cross shaft using a portable crushing plant on a 24/7 basis over a 2 year period. Transport ore from the zinc mine to the NBHC mine over 3 years of a 24/7 basis in Broken Hill. 1 million tonne/annum. Desilting and constructing new water dams in the far west of NSW. 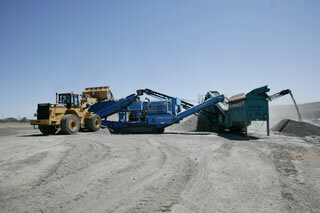 Win, load and haul 850,000 tonne of mill tailings from Zinc mine to North mine in Broken Hill. Design, form and bitumen seal 1.5km airstrip at Tandou farm, south of Broken Hill. Manage raise drill rig movements for Western Mining 1990 - 2000, 45 semi's per movement = 1,200 tonnes per movement. Primary and secondary crush 1 million tonnes of minus 75mm crusher run and place down bore holes at Roxby Downs for backfill for Brambles - WMC. Supply and deliver special low srinkage concrete from on-site mobile batch plant to Lake Pamamaroo inlet regulator for Dept Land & Water Conservation. Roads & Traffic Authority NSW - supply and deliver 7,000 tonnes annually of sealing aggregate. Roads & Traffic Authority NSW - win and crush 20,000 tonnes per year of 20mm road base at Tibooburra for north/south road project since 2004. Central Darling Shire campaign crushing of road bases since year 2000. Design and construct 64km of dual lane haul road for Bemax Resources.